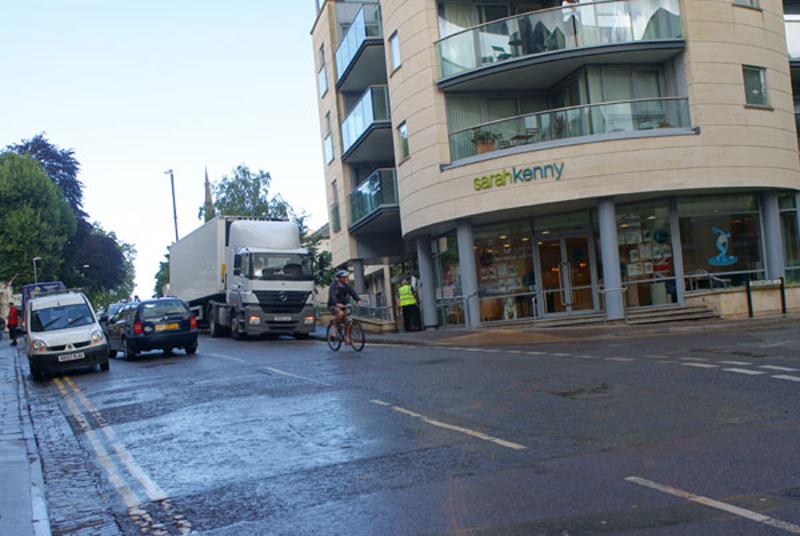 This blog was provoked by a request in the Bristol Cycling Campaign web forum for views on a shared-use path that crossed the large IKEA site in the Easton area of the city. Because two family members live near to it I have used it a few times as part of a route between their homes. So I thought I ought to chip in. Rather than post my own confusion about the route I decided to go and make a more detailed assessment. This account of what I found starts on the north east end of the route and works its way south west. As we stop for photographs I mull over some of the continuing difficulties that such routes present for cyclists and walkers. Picture 1 (see above) was taken on Easton Road, a dual carriageway that feeds and disgorges motor vehicle traffic to and from the large retail sites (mostly Tesco and IKEA) close to the M32. Easton Road does have bus stops but there is only one bus stop (IKEA) that gives access within the retail areas that is in any way comparable to the convenience enjoyed by car users. Let’s move along to the roundabout visible in picture 1. I was on a bike. This is a shared journey, so just allow a bit longer to get to picture 2 if you are on foot. In picture 2 we can just about see evidence of TESCO and a Pizza King (or is it a Burger Hut?). At this range my eyesight is more absorbed in watching for motor vehicles than direction signs but our target is somewhere off that second exit where the white van might be going. When did use of indicators become a widely recognised sign of weakness? Having taken that second exit, we see that spending opportunities present themselves immediately. Walkers and cyclists might feel a bit overwhelmed by the scale. But at least there is a shady foot-way with a dropped kerb on the approach. Cast your eyes on the shrubbery in the centre of the picture. Our next picture steps closer to it. This is the first clue about that shared-use path. I think it’s odd that the signed announcement of a path is not accompanied by a direction sign to tell us where it goes. Glancing back at picture 3 you can also see that getting across to that opening is going to present problems. It is a very wide road. I find myself wondering if all shared-use signs suggest a riderless bike crowding a parent and child to the edge of the path? Is this negative subliminal advertising or just the unconscious assumptions of a graphic designer made real? Crossing the road was awkward and would have been much worse in heavier traffic. Nevertheless, things look better now. The path is only single file for each type of user but the indication of which side to use is clear enough. The surface is unbroken and (probably) slip resistant in wet weather if leaves are swept. Setting off in the journey I’m still disconcerted about the lack of a direction sign. There is nothing in this aspect that tells me where I might be going. No landmarks at all. The word “legible” is sometimes used in this kind of situation. I should be able to read the path in some way and feel confident that I won’t be coming back again after fifteen minutes of following a misguided hunch. At a little after nine in the morning it is very quiet here so there is no one to ask. The path travels for 2 or 3 hundred metres along the side of IKEA and at this point (see photograph 7) there is a slight incline with maybe some potential for those wet slippery leaves at some times of year. If I did slip the unyielding sides don’t look as comfortable as the hedge might have been. If I were walking up the slope with a baby buggy, I wonder how much escape room there would be if an over-enthusiastic cyclist came bowling along in the other direction? A bit further along I notice this yellow intrusion. Our shared use path crosses a long set of steps that connect IKEA with the car park for Eastgate Retail Centre (Halfords and Laura Ashley etc). The strong impression I get is that when these places were designed the assumption was that cars had to be hard-wired into the retail process. Anything on public transport, foot or cycle could sort itself out at the fringes and needed no special attention. If this specific path has any purpose the physical cues suggest, inaccurately as it turns out (see detailed layouts here: http://tinyurl.com/hmpo66f ) that it was made to keep walkers, bus passengers and cyclists out of the way, not to help them do business with the retailers. The visual clue in photograph 9 is that there is no clue beyond the steps either. Another couple of hundred metres reach ahead, but we still can’t confirm where it goes. The sun is over our left shoulder and it’s morning, so we are probably travelling westward. One day everyone will have a device that guides them everywhere to anywhere they chose. I will choose to leave mine at home and enjoy the rich geography of travelling, unaided, on a bike. For the time being most people who would like to walk, get the bus or cycle are given a bit of a rough time because so many concrete (sic) decisions have already been made that they should be in a car for most of every journey that matters. If this is starting to get a bit dull – point made I suppose. Here (picture 10) is the next section of the well made shared path. We have the IKEA car park to our left, having got to the end of the very large IKEA building. It’s worth reflecting on the fact that the IKEA floor layout is specially designed to prevent customers getting straight to what they have come to buy. Browsing and getting a bit lost is as good as compulsory. There are no signs to discrete departments or items. This reminds us that designers and architects are not oblivious to the significance of physical layouts and route design. 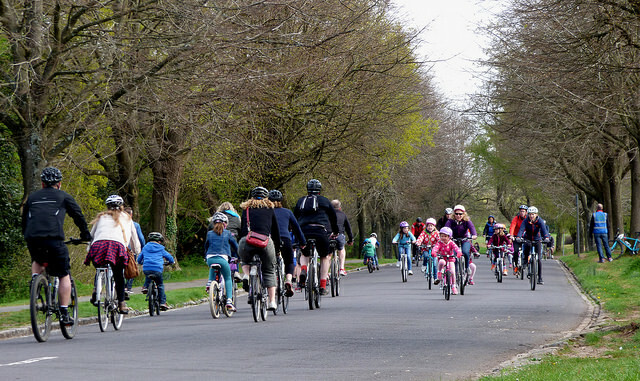 It also tells us that those who, so far, have laid out our cycle and pedestrian paths did not attend the same courses as the retail planners even though, in this case, they have come up with surprisingly similar outcomes. Eagle-eyed readers might be able to discern a blue blur in the far distance of picture 10. It’s a direction sign that tells you where to go from there. My bridge camera’s absurdly generous zoom feature (see above) can see that …ton Road lies ahead. All is good then. 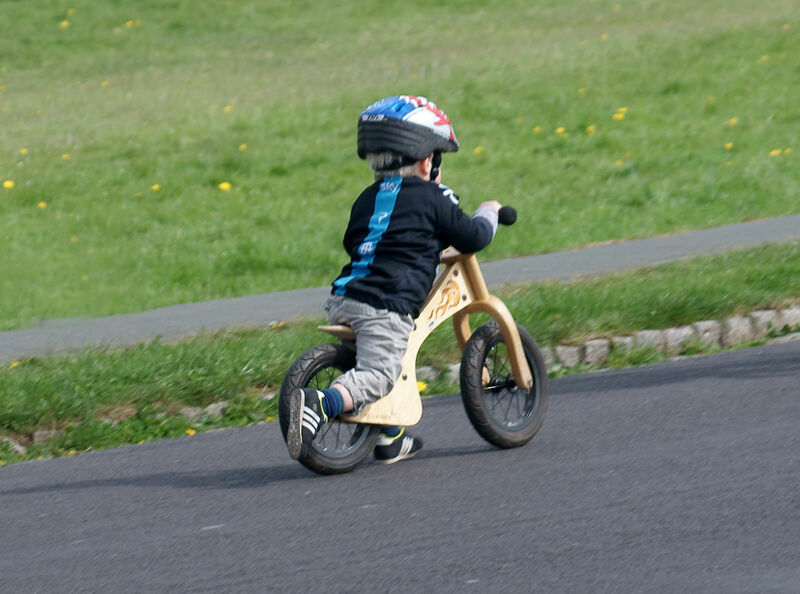 Zooming back to real life, a real cyclist appears. So far this has been the first I have seen on the path. Back on Eastgate Road and Muller Road I had seen a few more, some on the pavement, all looking a bit uncomfortable and reluctant. Moving on, I got to the end of this section and wondered why, at this particular point, a direction sign to a road which, until now, had never been mentioned, let alone have its own signpost, had been erected. 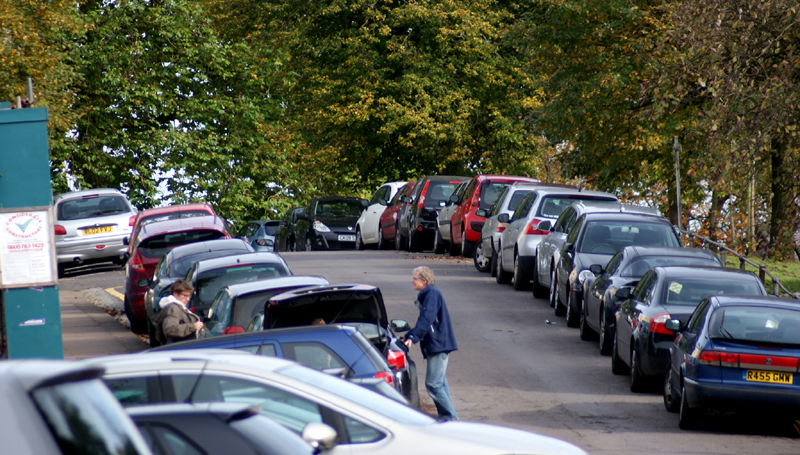 At this time of day the car park is empty. The route in this section has useful indications that this is a route and that people will be moving along it and that vehicles should probably give way. Trees and advertising boards help to reinforce awareness of the presence of the path. The paving gives another big hint. This is my favourite part of the whole route. I can see it’s a path, everyone else can see it’s a path (and which side they should be on) and I have been encouraged with the well-signed knowledge that I am going somewhere specific. As I am crossing, a pedestrian and a cyclist show up at the same time. This path, like so many other local features, is known to a few but (I’m guessing here) used by only a fraction of those who might use it more frequently if they knew more about it. As we feared, the end of this section has no signs. A choice of ramp or steps is obvious but it’s not clear at this level whether they go to different places. A quick hop to the end of the ramp confirms that each option leads to the same place – New Exhibition Road. From the ramp end another direction sign is visible – Stapleton Road is mentioned once again. I wonder if these hints were to appease Stapleton Road traders who saw a nearby threat being planned uncomfortably close to them? The sign is a sign, but when viewed from the steps out of the IKEA car park, it looks like this. This concrete obsolescence is the M32. Pollution levels are high. We are leaving New Stadium Road and joining Napier Road. A row of houses in the sunshine beyond the M32 mark our arrival at Stapleton Road. A huge sign on the motorway above reminds us that people driving cars get lots of help with remembering where they are going and when they need to turn off. The cycle crossing is for the Frome Valley Greenway which follows the line of the Frome River right into the city centre. It’s a successful shared-use path that could do with a bit of refurbishment and improvement (especially where it uses narrow underpasses beyond Junction 3). My journey takes me south, so I shall be turning right at the crossing. I shall be turning right because I know the way. There is no obvious signpost to help the uncertain despite this being a pretty major junction. Photograph 21 gives a better view of the raised table and road markings that enable users of the Frome Valley Greenway to take their right of way against motor vehicle traffic. It works well. As we follow the gap between Stapleton Road and the Frome Valley Greenway we finally see a useful signpost just before the railway line that marks the edge of Fox Park. Unsurprisingly the shops are signed but the nearby railway station isn’t. “Commerce trumps sustainable transport”seems to be a major theme of this exploration. In conclusion, we have travelled no more than a kilometre and seen a lot of failings in what is still one of the best off-road short-cuts in the city. My personal hobbyhorse in such things is the failure to make such routes as visible and legible as possible. Here’s a picture of a good sign. The same sign featured in photograph 22. There need to be a lot more like it, they need to be regularly maintained and more destinations (schools for example) should be mentioned. Cyclists are not racing past, they have time to read what the signs say. Every journey can be an encouragement to use the bike for new destinations and to explore more of the city. Signage costs a lot less than rocket science and is far more worthwhile. 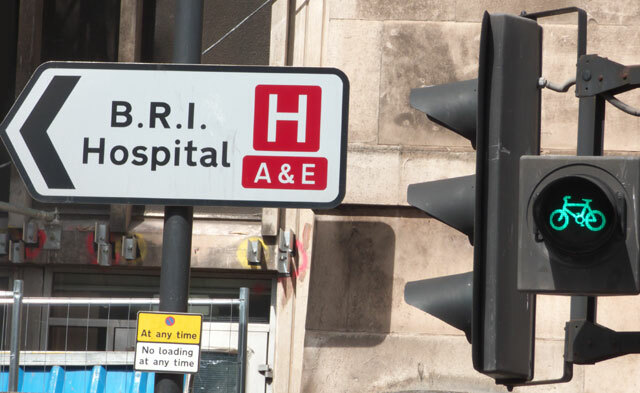 This month another batch of road casualty data was published by the Department for Transport. Grouped by Police Force Area, it comprises the most recent twelve months figures for each area up to January 2015. 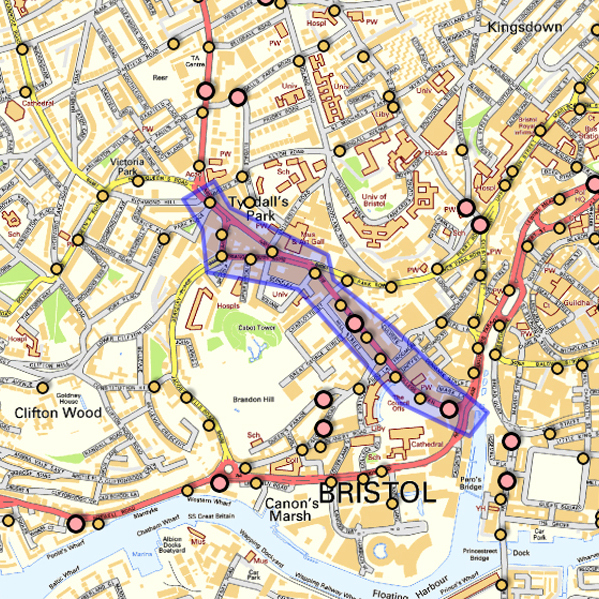 I have extracted the following graph, comparing the area surrounding Bristol (the Avon and Somerset Police Force Area) with Gloucestershire (because we are neighbours) and with eight other (mostly urban) areas where the largest cities can be found. Have a look first and see what sense you can make of it and what questions it raises. The per capita columns, in red, warn us that London had the worst odds for anyone wanting to avoid injury in 2014 while the green columns suggest they also have the best odds for avoiding death. Gloucestershire stands out as having by far the worst record for road deaths per one thousand people and being one of only three areas (along with Avon and Somerset and Nottinghamshire) where fatalities are disproportionately high when set against figures for all casualties. The contrast between Gloucestershire and London (The Metropolitan and The City of London Police Force Areas together) is striking. 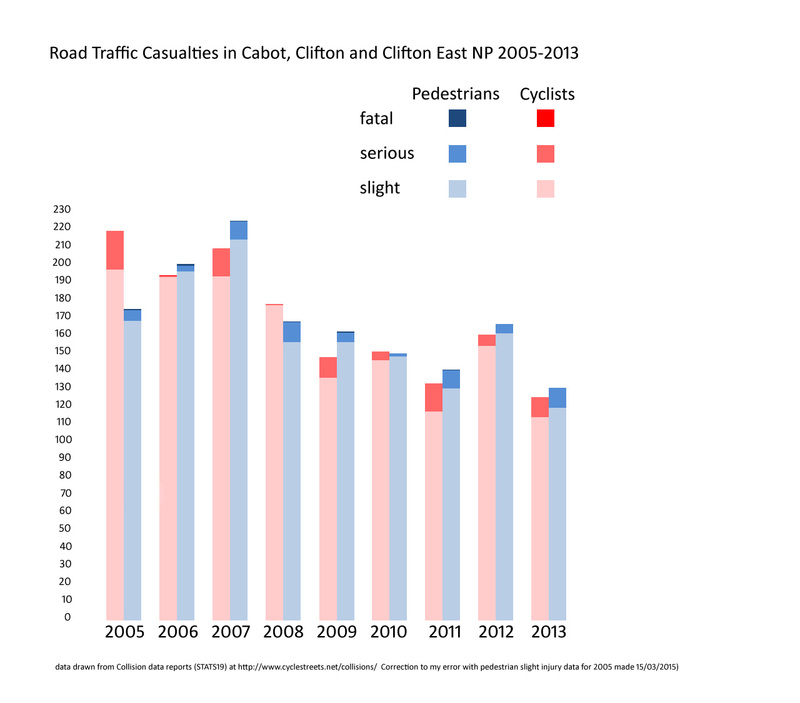 In Gloucestershire fatalities make up a much bigger share of the road carnage than is the case in London. Beyond these simple generalisations there are only questions and guesses. I think I would be going to Gloucester and to Bristol (and Nottingham) and asking to see data on every fatality for that 12 months and asking what design suggestions emerge from the forensic evidence. Are any related to road layouts? To speed? To surfaces, signage or sight-lines? If carelessness is involved could the road or its immediate environment have reduced the danger of someone being careless another occasion? I have one other thought arising form this graph and that is that however unreliable the data for injuries are, we can probably treat data on fatalities as highly reliable. We know that a lot of casualties go unrecorded, even when injuries are sustained but deaths are different. Areas that have what appear to be relatively (rather than absolutely) high on fatality rates might simply be under-reporting slight (and even serious) casualties. Mostly, I wonder if anyone knows of research that analyses the lessons learned from road fatalities or the effectiveness of actions that have been taken as a result? 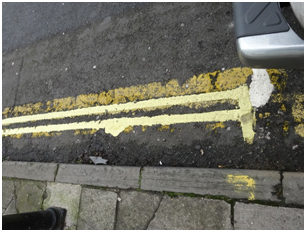 Last week I tackled the men when I saw them painting broad yellow lines and told them they should be putting down primrose yellow narrow lines since it is a conservation area. They said they that if there were broad lines before they would be replaced by broad lines since they would have to burn off the lines and start again. This is simply not true, there are many places where you can see narrow lines on older yellow lines (eg Princes Buildings). You also get the stupidity of Royal York Crescent and the Paragon where you have narrow lines on one side and broad lines down the other. 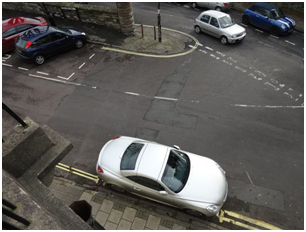 You get joins of broad lines to narrow lines eg top of Princess Victoria St, and Royal York Crescent. There are also all sorts of stupidities down Princess Victoria Street. 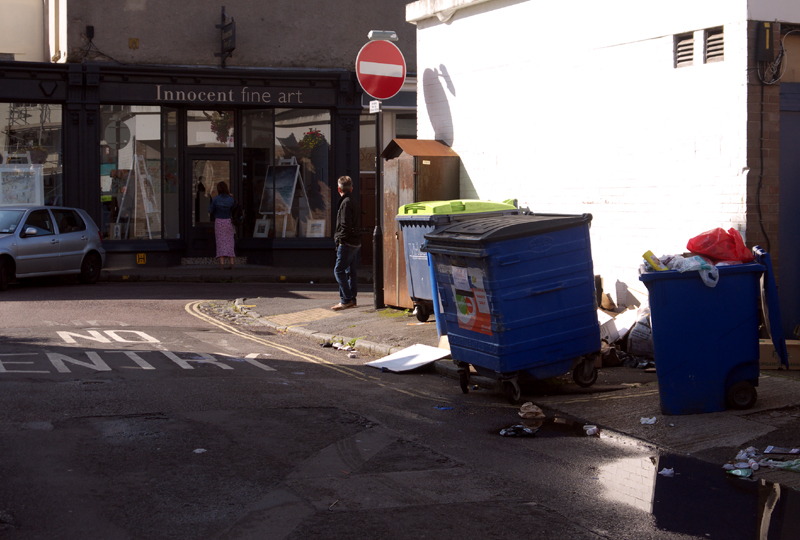 They have put yellow lines outside a shop (about number 69) which has no off street parking and outside other houses further down the street (89). 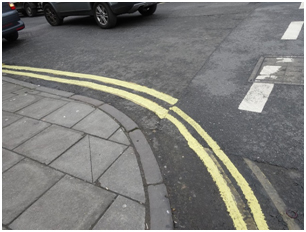 I can see that a lack of primrose coloured paint on narrowed double yellow lines might make some people slightly agitated and I can visualise a perfect world in which it would really matter (Staithes in North Yorkshire comes to mind). However, this is a note about Clifton in Bristol. Clifton has its attractions, but the elegance and aesthetic appeal of its roads, streets and paths are not among them. Even if they were beautiful it would be hard to see them on some days for the numbers of cars, buses, vans and lorries parked on or moving slowly along them. Here are a couple of my own snaps. So what’s my point? I’m not sure really. Firstly, I think that motor vehicles are becoming the ruin of our pleasant city and secondly I think that some individuals are starting to use the policy vacuum of artificial “neighbourhood” structures as a ventilation for trivia that drive out consideration of things that have wider and greater importance. I have attended a few meetings of the Cabot, Clifton and Clifton East Neighbourhood Forums but I don’t think I shall be there tonight. This section of a CycleStreets map focuses on one lively part of Bristol. It’s where I go shopping sometimes. It also includes my favourite uphill ride in the city, a gradient that suits my 65 year old sense of fun. The best known section is called Park Street. 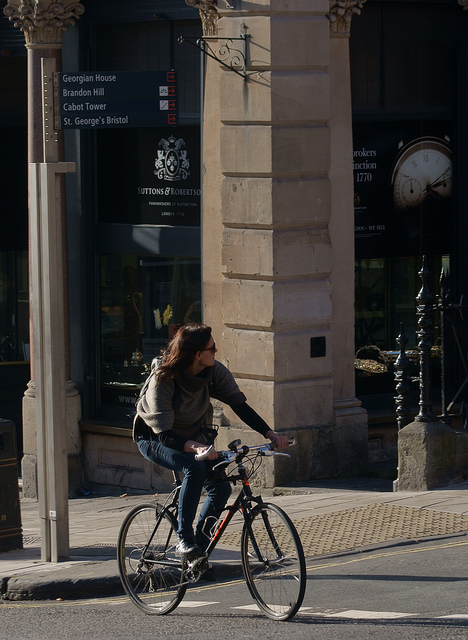 Lots of people ride up and down Park Street despite the well-rehearsed myth that Bristol is “too hilly”. But never mind the gradient. Look at the RTC data from CycleStreets brilliant search tool. In the map reproduced above I used a mouse to click round the blobs of shame that mark all the failures of gravity, attention span, entropy and other abstractions that ended up with someone in A&E. Towards the north west end of the marked area is a mess of ill-made streets called “The Triangle” On its hypotenuse is Queens Road. Reducing speeds to 20 mph would be good. It seems to me that most of these could make a difference to the casualty stats for people on foot. As a big bonus they would also make life gentler for anyone riding a bike. I looked for pedestrian casualties where a bicycle had been involved. The data run from 2005 to 2013. There was just one. It was a slight injury collision in 2012. It was at quarter to three on a Sunday morning and both parties needed treatment..